Calabay Parc at Tower Lake is on a gated community. • A coded front door lock box so no need to collect the key from somewhere else. • - FREE Local/US/Canada telephone calls. • - FREE Cable TV. • - FREE PS2 and games. • - FREE use of high chair, stroller and travel crib. • - FREE use of a safe to keep your valuables safe. • - FREE games room with pool table, football table and dart board. • - FREE use of BBQ. • - FREE Gas and electric. • - FREE Air conditioning. This development has its own private lake and fishing jetty. Walmart and lots of restaurants are an easy 5 minutes away. Tower Lake is only 10 minutes away from the new multi million development at Posner Park which when completed will provide fine dining, distinctive shopping, theatres and more. There are no shortage of championship quality golf courses within easy reach of Calabay Parc. One of Florida’s top PGA golf courses, Southern Dunes, is located next door at Southern Dunes. 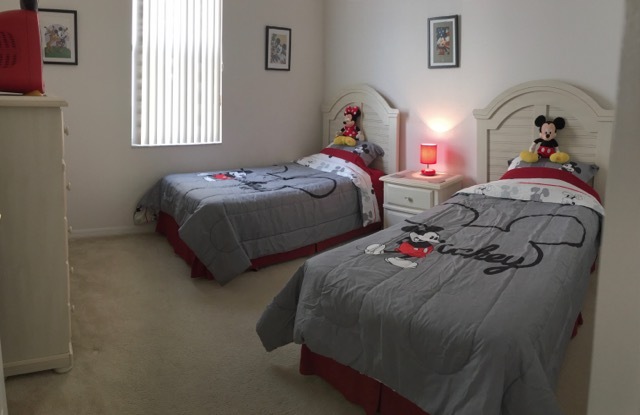 Our villa is located just 15-20 minutes from Orlando’s main attractions including Disney World, Sea World, Discovery Cove and Universal Studios. One of the newer parks, Legoland, is only 15 minutes away with over 50 rides! Publix, Walmart, Walgreens, and numerous other retail outlets together with take away food restaurants are only 5-10 minutes away. Our villa is situated on an exclusive plot and benefits from not being overlooked by any other properties at the rear. We have a computer at the villa for exclusive use of our guests together with FREE fast wireless internet access. We have a telephone with FREE calls to anywhere in the US or Canada. Our pool/lanai is south west facing giving plenty of sunshine until the sun sets at the end of the day. Our local Management Company are on call, should you need them, 24 hours a day. Where the rate shows '+ tax' alongside, then local taxes at 12% must be added to this price. Quoting US Dollar prices net of local taxes, is common place. Where '+ tax' is not shown alongside, then the prices already include local taxes. To estimate the price to rent this villa, enter the number of nights to stay and select the period which corresponds to your arrival date. Where there is a change of rate during your stay, this will not be factored into the price. If the everything looks ideal, don't forget to enquire about this villa. "Lovely Villa in a great location. Not to far to reach theme parks but far enough away that you could escape to the tranquil Villa location each evening. Choice of supermarkets and restaurants nearby Nice to be able to relax in the warm jacuzzi after a long day of having fun. Sally was excellent to deal with and very efficient. Thanks again Skinner family"
"I was a bit hesitant to book without a travel agent involved but I''m glad I went with my gut feeling. The villa was fantastic - well equipped,comfortable and clean - home from home. It is ideally placed for all the parks and has some brilliant eating places close by. We took our family, including 2 grandchildren and they thoroughly enjoyed the holiday, especially the pool and hot tub - the grandchildren even complained when we made them get out to go to Disney''s magic Kingdom!! Sally and Steve were very friendly and helpful and we would definitely recommend staying at their villa. Bev, Steve and gang"
"This was our 2nd stay at the villa and was even better than the 1st! The villa is so homely and relaxing and is such a great place to return to after a busy day at the parks. The pool and hot tub are fantastic and we definitely made the most of these every day. 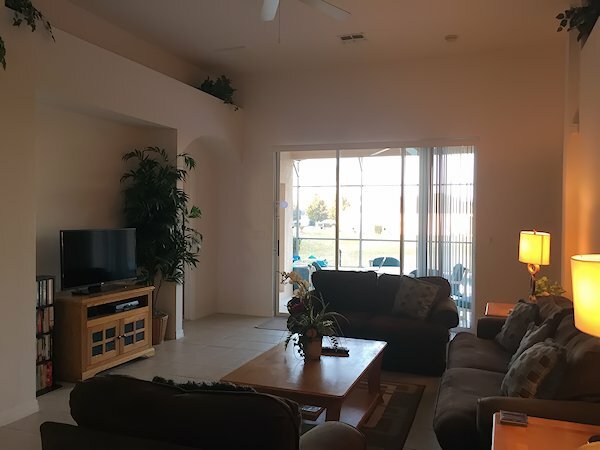 The villa is in a great location with easy access to all the Disney parks being about 20 minutes away and Universal and Sea World about 30 minutes drive. I would definitely recommend a trip to Busch Gardens as well which has some of the bigger rides and tends to be a little quitter than the Universals. If you have any evenings spare, I would also recommend going to Universal after 6pm as it usually stays open until 10pm and parking is only $5 after 6pm and the queues are only about 10-15 minutes long so you can get on everythi"
"We travelled to Tyler''s Holiday Villa with friends in May 2015. We travelled with high expectations having heard fantastic reviews from other guests, but despite this, our expectations were exceeded even further when we arrived. The villa was immaculately clean, and had everything you could ever need for a two week stay. Comfy bedrooms, lots of bathrooms, a great sized kitchen and a wonderful sociable living area made for a fantastic stay. One thing that deserves a specific mention is the Fridge!!! You won''t run out of room, that''s for sure. Outdoors was even better. The villa has an absolutely amazing pool (which gets the sun all day) and an even more amazing hot tub ("Afternoon Sangria in the Tub" became a much loved, daily tradition). The sun loungers were comfy and there w"
"Had a great time in your villa for 3 weeks. It was home from home. It had everything we needed and more. Kids loved the pool and the games room. It was so nice to come back to and relax after having long days at the parks. We used Walmart a lot as it was only 2 minutes away. We would certainly come back again. Thank you Sally and Steve. Gillian, Jimmy and family"
"Stayed in June 2012 and the villa was in an excellent location. Walmart is local and I4 that getting to the parks is not far either. Very impressed with the villa and excellent for price. All modern amenities and Sally very helpful when asked questions about area etc. Would definitely stay again. Thanks." "We had a fantastic stay in Florida and the villa is really wonderful and had everything we needed. The boys especially loved the pool and I loved the hot tub after a long day at the parks! We did so much during our 2 weeks there and it went so quickly. The villa is so accessible for all the parks and Busch Gardens is a must especially if you have older children. During our stay we went to Sea world twice, Busch Gardens, Kennedy Space centre, universal studios and universal islands of adventure. We also spent a day at Daytona Beach. We went to see Orlando Magic which was brilliant- would definitely recommend. We also had a couple of days shopping. We really hope to visit again as there is so much more we still want to do. Thank you so much for letting us stay in your lovely villa!" "Hi Sally and Steve We had a great holiday, absolutely loved the villa, loved the villa layout and the openness of the hallway diner/kitchen. Very quiet area and very private. Easy access to the I4 and the parks. Visited Anna Maria Island which is a must for everyone, beautiful quiet beaches and a touch of paradise. Silver springs Ocala is a must visit to see the glass bottom boats and the springs - amazing. So we are looking forward to go back again 2014. Loved it!Thank you. Julie, Jackie and Mum Isobel "
"The house and pool are wonderful. I have a sister who lives in the same neighbourhood so this house was especially convenient for us. Although the main purpose of my visit was a family event, we visited both Disney World and Ft DeSoto State Park. The Tylers not only have an excellently maintained house, but were easy to work with on the booking details. Thank you." "We had a wonderful time staying at Sally and Steves lovely villa - the kids had a great time in the pool and with only about a 20 minute drive from all the theme parks it is ideally situated. 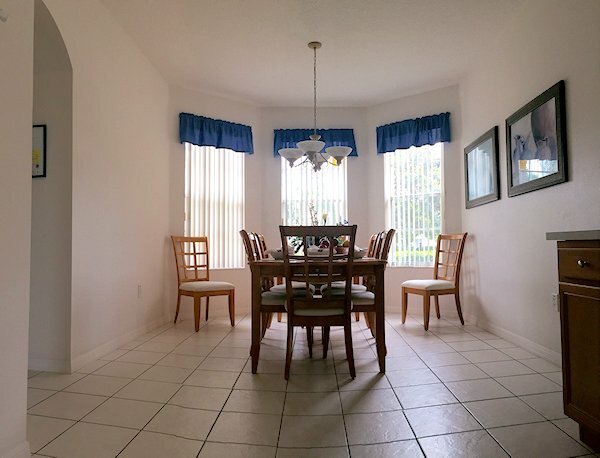 I would recommend any family thinking of going to Florida to rent their villa!" "Great villa! Not too big and it had a homely feel. Clean and perfectly positioned to reach all areas. Thanks." "Fantastic villa which is tastefully furnished with very comfortable beds. Added bonus of the jacuzzi which was well used. 5 stars! PS Mannys is great!" "Very clean and spacious. 20 minutes from Disney. Great food in the area. Gated community with 24 hour security at the front gate. Nice lake in the area for fishing. Kids love the playroom!" 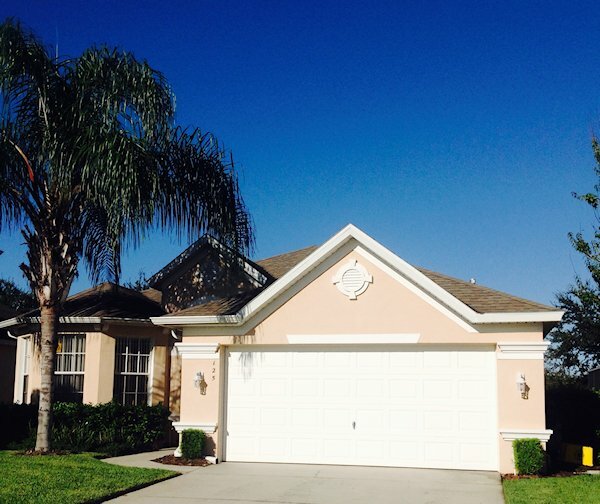 "Dear Sally Thank you and your husband for renting us your beautiful home in Haines City. We had a great time. The house was very very well maintained by your Management Company. Maybe we will be able to rent your house again in the near future. Thanks again and happy holidays! 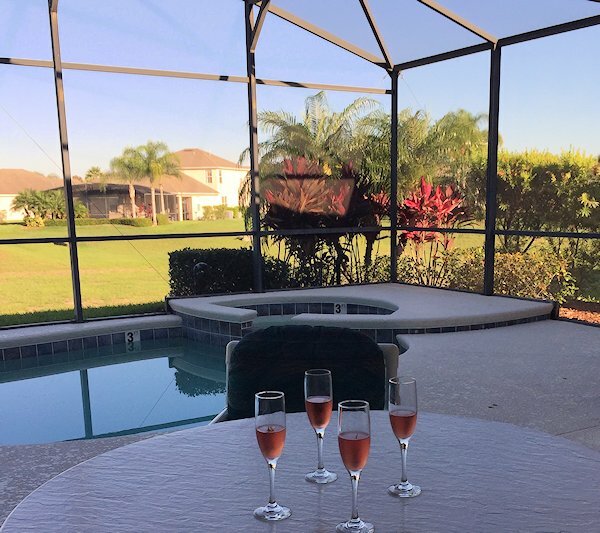 Jacqueline"
"This was our first visit to Florida and the Tylers villa I have to say with The Tylers villa it is not going to be the last but the first of many we hope. Despite the not too warm January weather, we had two weeks of REAL SUNSHINE, no rain, and coming from England, we felt so blessed! We visited many places and enjoyed them all - The Kennedy Space Centre; mesmerising, The Kissimmee National Park: amazing trek amongst unseen wildlife, Clearwater Beach for a swim and shell picking, West Palm Beach. We went to Orlando Magic and La Nouba Circ du Soleil in Downtown Disney: amazing. We’ve eaten out a yummy places: Mannys Chophouse (just down the road) and Chillis (both delicious). We had lots of fun, enjoyed the villa and its swimming pool and spa overlooking nothing but green! Th"
Pool/Spa heat is charged at an additional £120/$160 per week. Rentals of less than one week are subject to an extra cleaning charge of £70/$90. Arrival time at the property is after 4pm. Departure time from the property is before 10am. All bookings are subject to a non-refundable deposit of 20% with the balance due 8 weeks before your holiday hire. All rental charges are inclusive of Florida State Resort Tax. Preferred method of payment is by direct transfer to either our UK or US bank accounts. Alternatively we are happy to accept cheques or paypal (Please note Paypal is subject to a surcharge of 4% dependent on the extra cost at the time of booking. 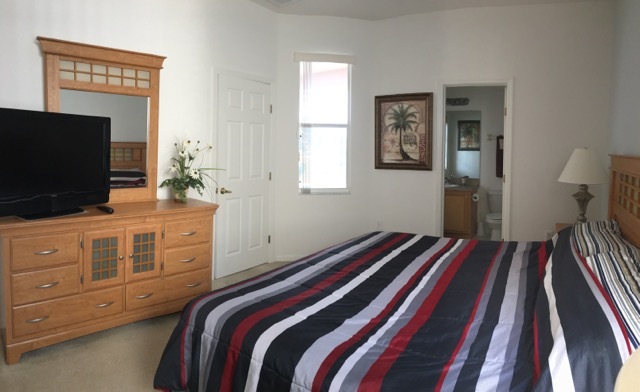 A newer Calabay Parc gated community offering an array of luxury villas, some with views over Tower Lake and others within a few minutes walk. For the fishermen (and women) there is a fishing pier and plans for a community clubhouse - where you will be able to swap fisherman's tales. For golfers there is the Southern Dunes County Club and course which borders the community and lake, so no excuses. When staying towards Haines City, expect a more rural, less glitzy feel - which can be a big plus to many visitors. Restaurants will not be as busy at peak times, prices should be cheaper and yet all the parks and attractions are accessible by heading north on Interstate 4. Shops and restaurants are located more towards Haines City, with a local WalMart, Winn-Dixie and Walgreens Pharmacy all less than 2 miles away. Here you will also find Quiznos, T-Bones steakhouse, Beef O'Bradys, Taco Bell, Burger King, MacDonalds and a Chinese buffet amongst other eateries. When heading towards the parks and Interstate 4, the newly opened Posner Park shopping outlet is located around 10 miles north of the area (just south of the junction with Interstate 4 and US27). Here you will find major retailers including a JC Penney department store, Michaels, Target, Ross, Dress for Less, as well as eateries and a British tavern. In case of emergency, the local medical walk-in centre and regional hospital is less than a mile away. All crockery and glasses/cups etc. There is a large table with 8 chairs in the dining area. Telephone with FREE calls within the US and Canada. There is a 37” wide screen TV with Cable and DVD. We have a computer with full high speed wireless internet for exclusive use of our guests. There are also a selection of games, books and DVD’s to suit all ages. Our sofas are for your relaxation after a long day at the parks or playing golf, or at one of the lovely beaches. Full ensuite with Corner bath, a large walk in shower, 2 hand basins and a separate WC. There is also a large wardrobe. Ensuite shower with handbasin and WC. Door from shower room to pool area. Our main bathroom is situated between the two twin rooms. It has a bath, shower, basin and WC. All bedding and towels for use at the villa are included. These are situated in the linen cupboard which is situated in between the family bathroom and the twin bedrooms. Optional heated swimming pool and spa (heating at extra cost). After a long day at the parks, shopping, golf or beach take a well deserved rest sitting under the lanai by the pool, sipping on a cold drink. At night you will be able to watch the sunset with the pool lights on or relax in the spa. • A Gas BBQ is located on the lanai for your use. • South-west facing sun deck. • Lanai with 2 patio tables and chairs. • Poolside Child Safety fence. • Pool Toys and Inflatables. Or for the children to send the adults to so that the children can play in the pool!! 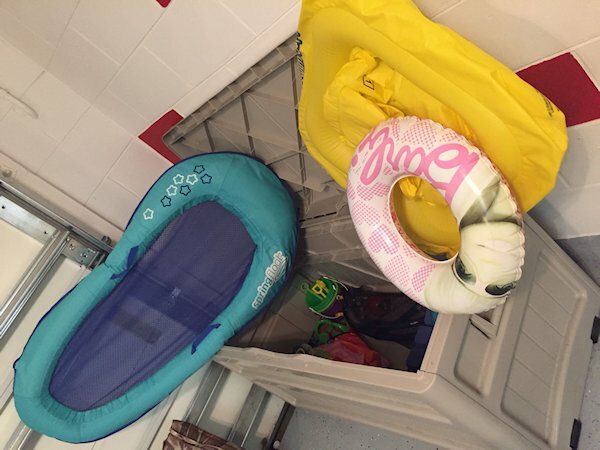 Storage of pool toys is kept in the games room. 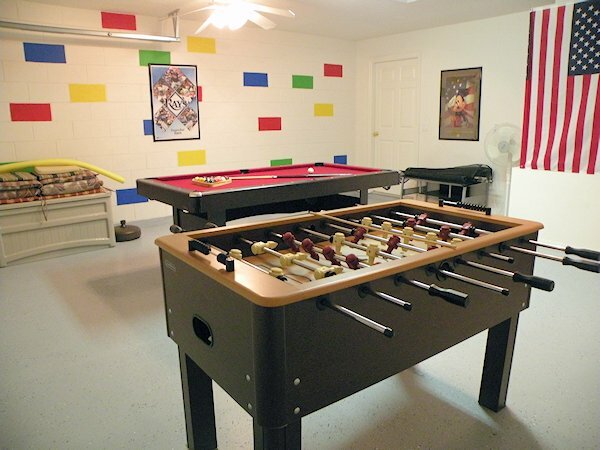 There are also 2 ceiling fans and a floor fan to keep the games room cooler in the summer months. If you want to get all your washing and ironing up to date we have a full size Washing Machine and Tumble dryer and also a Iron and Ironing Board. 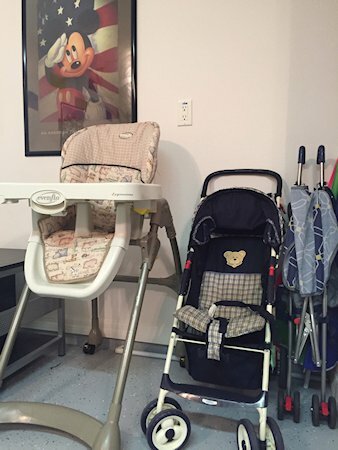 There is a high chair, stroller and child car seat which is kept in the Games room. The travel cot is kept in the wardrobe in the Main Bedroom.